Which Natural Mosquito Repellent Works Best? A number of essential oils can be used as natural insect repellents and help you avoid those pesky and potentially dangerous mosquito bites. These can make good alternatives to the popular sprays that contain synthetic chemicals like DEET. Plus, they almost always smell better. From lemon eucalyptus oil to clove oil, you do have some options, though some have been found to be more effective than others. Quite often, products that contain these oils need to be applied often, at least once every hour. Lemon eucalyptus oil has been found to be the most effective natural mosquito repellent. Studies have found that the efficacy of this particular oil falls third in line, behind DEET and picaridin. It is the only natural repellent that is registered with the U.S. Environmental Protection Agency (EPA) and recommended by the Centers for Disease Control and Prevention (CDC) for effectiveness and human safety. Mosquito repellents that contain this combination of essential oils, such as Repel Lemon Eucalyptus, have been found to be as effective as the top chemical products. Some claims even say it works better than DEET. Early studies concluded that the Repel product provided 120 minutes of protection from mosquitoes. The one problem that some people have with these products is the odor. However, the fresh smell of lemon and eucalyptus is probably not as obtrusive as many non-natural repellents. 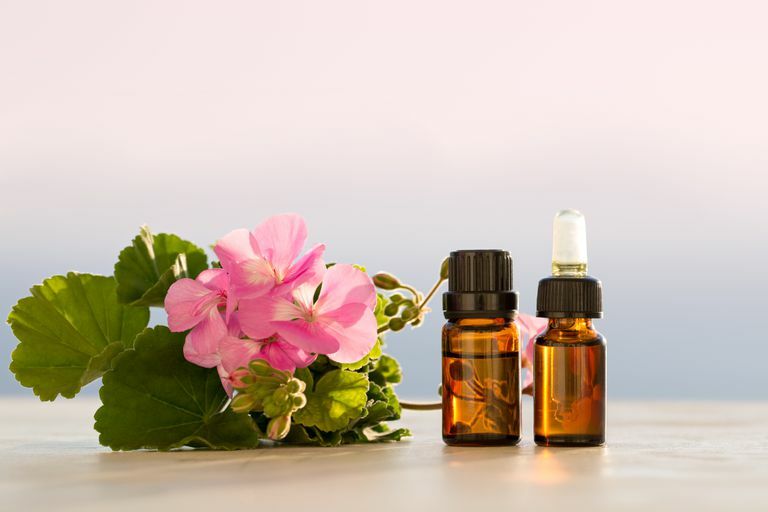 Geranium oil is not included in the EPA's registered repellent ingredients, so it is not included in their studies for effectiveness. However, it is one of the more common essential oils in natural repellents. One of the best-known brands to use geranium is Bite Blocker. The studies on this organic repellent vary greatly in effectiveness, from just over one hour to as much as seven hours. It's thought that the combination of geranium oil and coconut oil contribute to its success, though neither one alone is as effective as DEET. Citronella is a well-known natural mosquito repellent. The oils from the plant are used to make lotions, sprays, and candles. In some studies, citronella-based repellents have been found to be as effective as DEET. The main problem with this old standby is that it can evaporate within two hours, depending on the formula. Newer findings have discovered that combining it with vanillin can slow down the evaporation. Those citronella candles we have long used on patios and when camping are not as effective as skin applications. Candles, which offer continuous evaporation of the oil, have been shown to reduce mosquitos by just 50 percent. Other natural ingredients are being explored, however, scientific support for the claim that they can effectively repel mosquitoes is limited. Patchouli Oil: Concentrated patchouli is one of the most effective essential oils. According to one Chinese study, it can offer complete protection for two hours. Many people will agree that it has a very potent aroma, which is why some people have an aversion to it. There are no noted hazards in applying it to your skin. Nonetheless, it's best to use a carrier oil with any essential oil. Thyme Oil: Carvacrol and alpha-terpinene, two compounds derived from the essential oil of thyme, have been found to have significant repellency characteristics. Certain concentrations are more effective against particular mosquito species, but most topical applications offer at least 89 percent efficacy for about an hour. Thyme oil must be diluted because it can cause skin irritation. One study found that burning thyme leaves offers 85 percent protection for at least an hour. Clove Oil: Two studies have found that undiluted topical clove oil is active against mosquitoes. The studies concluded that it's effective for nearly four hours. However, like thyme oil, clove oil should not be applied undiluted to skin as it can be absorbed and result in adverse effects. Peppermint Oil: Studies in both Brazil and Bolivia found peppermint oil to be very effective as well. The undiluted essential oil was shown to be an effective repellent for 45 minutes. No skin irritations were noted for peppermint. Cedar Oil: Cedar is part of the Pinaceae family which includes other pine trees. These have long been used as insect repellents. The essential oil of cedar has also been shown to be among the most effective oils. However, there are allergy concerns for some people. Neem Oil: An extract from the tropical neem tree, neem oil has insecticidal compounds called azadirachtins. A 2 percent concentration of neem oil has been shown to be 56 percent effective for up to four hours. Garlic: Another popular theory is that ingesting garlic can provide protection against mosquitoes. A University of Connecticut study examined this claim. The data didn't provide evidence of significant mosquito repellency. However, subjects only consumed garlic once, and the researchers say that more prolonged ingestion may be needed. Before you use any natural mosquito repellent, it is wise to talk to your doctor to discuss your options. As mentioned, some of the oils may cause irritation or allergic reactions in some people. Just because they're "natural" doesn't mean you can just use them without proper knowledge and advice. Centers for Disease Control and Prevention. Prevention: West Nile Virus. 2015. Radha VP, et al. EPA-Registered Repellents for Mosquitoes Transmitting Emerging Viral Disease. Pharmacotherapy. 2016 Dec;36(12):1272-1280. Rajan TV, Hein M, Porte P, Wikel S. A Double-Blinded, Placebo-Controlled Trial of Garlic as a Mosquito Repellant: a Preliminary Study. Medical and Veterinary Entomology. 2005 Mar;19(1):84-9.